Draw realistic face tutorial front view. This post is a portrait study I did using Wacom tablet to practice portrait drawing for digital art. In this one, I am trying to use just default round hard and soft in Photoshop, not using any fancy or custom brushes just to see if I can carry it to the end. Most of you ask, what kind of brush do I use. I used a lot of brushes, but that's not the point. Most of the tutorials here that I made, I am trying to bring the principle to the audiences. If you understand the principle of how all the terms I am talking about above react and utilize them efficiently then you can at your best ability transform your thought onto any medium you wish. Portrait study is a great way to practice, it never gets old. Artist can always get better as he or she practice more with observation and determine to gain knowledge or insight to achieve the best possible outcome of the piece. Drawing people is one of the most difficult thing for any artist. Especially when you want it to look certain way and have different lighting, mood or even expression from the subject. 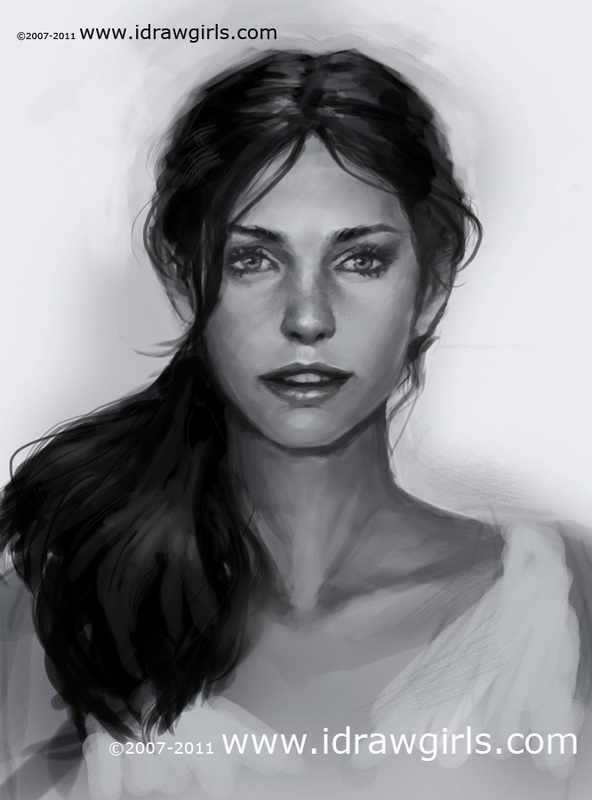 Anyway, here is another female portrait study front view. 1) I start of with the somewhat egg shape but a little angular because I want her to have a strong jaw line. I lay out the flat skin color (desaturated pinkish or egg shell color, any skin tone you prefer) as a base. Then I mark spots for where I would put her eyes. I paint the whole eye sockets because they are part of the face that usually case the strongest shadow, other under the nose and under the upperlip. NOTE* It's a big jump from Step 1 to Step 2 if you are wondering how to structure the facial feature, go to my previous tutorial how to draw face. Very basic stuff, now the puzzle is solved. 2) At this stage, I add some soft shadow all over her face very soft, then some shadow all the way from under her cheek bone on the side to her shin line to indicate three dimensional object and establish light source direction (light's hitting from the front). Then I went in to draw her eyes outline, eyebrows, nose tip, and lips. Thought these lines are not here to stay, they are there to give me some sort of guideline so that I can accurately put my paint on where I want them to be. 3) Paint as if you sculpt, the reason I put some soft shadow over in the previous stage so that I can pull out the light and give it an illusion of a 3D object. I paint the lighter value of color over the area that the light source would hit. At this stage, don't get caught up in detail, just layout the simple shape and flat color. I put lighter value all along her nose bridge to the tip, her cheek, the area above her upper lips, and her shin (These are the area that will get hit directly by the light source I previously established). Notice that I also add some strong shadow on to both sides of her nose bridge and darken the eye socket a bit to accentuate the form that was given by the light source. 4) Now I am working on her nose tip (Usually where it will get the highlight and strongest shadow). When working on nose try not to think like drawing, think of light and shadow. I usually don't draw nostrils, I just shadow it out or dark it out because most of the time you don't really get to see them if you squint for value (the more practice painting from life you will get the better result than using photo ref) . But on this one just for demonstration purpose I will do them just for the hell of it. Notice I painted in only two value under the nose, I can usually get away with one when painted. 5) Then I am looking for place where I can put darker shadow on her face to make her feature more prominent. Dark line in between her lips, more dark paint around her eye sockets and her eyebrows. 6) Now it's time to tighten things up by finding place to put my darkest value onto the image, under her shin, under her eyebrows (sockets), and some on the side to create sharp edge for the painting. I also bring some light out on her eyes a bit. 7) Tweak and refine the feature here and there, no major value or hue change to tighten up or clean up a little more. 8) Now I am lighting up her face a bit more by putting more light value her to her nose tip, above her lips and a bit on her shin. 9) As the face is coming along and look like a face then it's time to bring out some detail and put some highlight on her. At this stage I paint in her irises with highlight, a bit on the tip of her nose and on the edge of her upper lip. These area get hit by the strongest light. 11) Adding some hair on her face would be nice, and some highlight to give it dimension. Here is the one with just using Default Round hard and soft brushes. This one I touch it up in the last minutes with custom brushes because I want more painterly look and variation of textures. Also you might be interested in how to draw different looking portraits tips and technique. 30 MINUTES OF FREE VIDEO TUTORIALS. 3 Hours Premium Video tutorial. Digital painting tutorial: Draw and render female faces Premium tutorial. Full Length HD Video tutorial on How to draw and render 6 different female faces. In Depth and Intuitive! @Mac Thanks, yep practice will get you where you want to go. Good luck! Cheers! Hey i would REALLY love to know what brushes you use in photoshop, and if they are custom, if there is any chance you can set up a downloadable link for your custom brushes. @Anonymous WOW! LOL, DID YOU EVEN READ THE POST? IT SAID, "In this one, I am trying to use just default round hard and soft in Photoshop, not using any fancy or custom brushes just to see if I can carry it to the end."